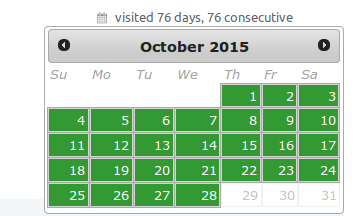 I was hoping for enthusiast badge which requires 30 consecutive days of visit.On 27/10/2015 around 00.10 am,it was showing 7/30 means 7 days out of 30 but today it is displaying 1/30.If anyone could explain reason behind this it would be a great help? I can't say how? but I am sure that is not system fault. For consecutive days, days are counted in UTC. In India (since you are from Gujrat) the new day counted after 5:30. But you can know which day(s) you have missed. Go to profile and click on consecutive days link. 1.My consecutive days in U&L. 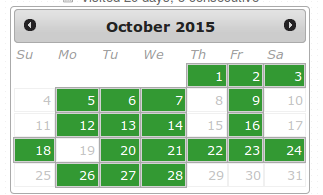 The gaps shows not visited days. What kind of role do the badges play on AskUbuntu? Are the review ban thresholds really wrong? Is this answer worthy of undeleting?